Lets be honest, the drugstore has been killing it recently. Obviously I had to buy a few of the new launches because it’d be rude not to right?! This includes the new Makeup Revolution foundation stick and concealer, a new mascara from NYX and some gorgeous liquid eyeshadows from Collection. 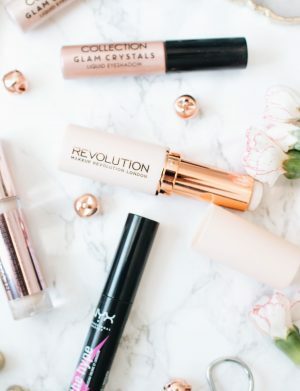 I think we should start off with the brand thats on every beauty lovers lips right now, Makeup Revolution. Their most recent launch is the Fast Base Foundation Stick. I’ve always dismissed foundation sticks because I just never thought they’d be as good as liquid foundation, but boy was I wrong. This has a very creamy consistency that blends out so well when used with a beauty blender and gives a really nice demi matte finish. For only £5, you can’t go wrong and the shade range is incredible! Second up is the Conceal And Define Concealer. This has been compared to the Tarte Shape Tape concealer and some people even saying its better, which is a big statement. I haven’t tried the Shape Tape so I can’t give you a comparison but I do know this is steadily becoming one of my all time favourite concealers. It gives great coverage and works for both under the eyes and to cover blemishes. Again, the shade range with this is 10/10, which is an amazing step forward, especially for drugstore makeup. Next up, I spotted that Collection had released some liquid eyeshadows and for just £3.99 I had to see what they were all about. I’ve been lusting over the Stila Liquid Eyeshadows for ages now but I just couldn’t part with £23 for one eyeshadow. You could pick up all of the Collection liquid eyeshadows for £16, which is still less than one Stila offering. Anyway, I picked up two of the lightest shades which are ‘Aura‘ and ‘Divine‘. Aura is a light champagne shade that I thought would work perfectly for the summer when I don’t feel like wearing much makeup. I do like this, although the glitter is quite chunky which makes it slightly hard to blend out but for under a fiver you can’t really complain. The second shade I went for, divine, is much easier to blend out and doesn’t have any chunky pieces of glitter. This is a light pink shade that I’m obsessed with and have been wearing on a daily basis as its so easy to just swipe on a go. I’m definitely going to pop back to Superdrug and pick up the other two shades. Lastly, a new drugstore mascara. I was using and loving my trusty Benefit BadGal Bang Mascara but it seemed to run out really quickly which was a shame. So, I picked up the NYX Worth The Hype Mascara as a replacement. I’ve been pleasantly surprised by this, although I’m not sure why because NYX hardly ever disappoints. This has a thick wand, which I prefer as it grabs onto the lashes much easier, giving more volume. The formula doesn’t cause me to have panda eyes by the end of the day either, which means its an automatic winner for me. 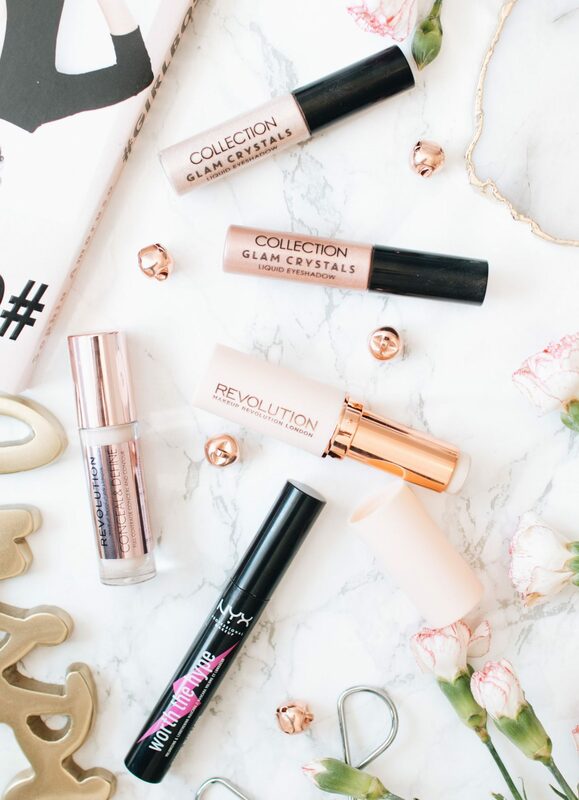 Have you picked up anything from the drugstore recently?